The Greenwell product is well known and widely used as a product that greatly assists NEWLY PLANTED TREES AND SHRUBS to thrive during the initial growth stage and therefore to ensure survival to maturity.The Greenwell product is placed around the NEWLY PLANTED tree trunk and buried partly in the ground.During watering events deep root watering is assured.Water run off and wastage is eliminated.With NEWLY PLANTED trees and shrubs it is essential to keep the root ball moist—the Greenwell product ensures that applied water, during watering events, is directed to the root ball therefore keeping the root ball well watered and moist. In hot dry weather periods MATURE TREES are often found to be stressed.Because the ground surrounding the tree is often hard and very dry it is difficult to apply sufficient water to the stressed trees to ensure their survival. Water run off does not allow the water to soak into the ground. The Greenwell product can greatly assist this situation by ensuring that an adequate amount of water is applied deep into the root system. 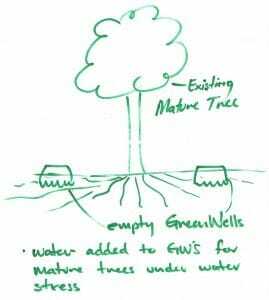 Simply place,partly in the ground, a Greenwell on both sides of each tree trunk. 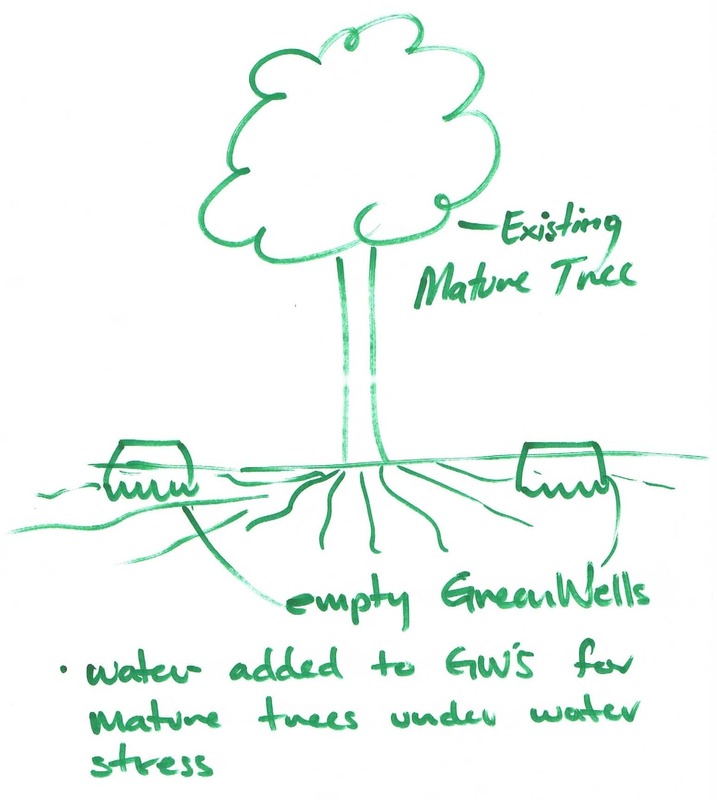 The diagram below clearly indicates this.When water is applied to the Greenwells it is delivered direct to the tree roots—no run off.During dry periods tree roots will quickly find and go to where water is applied in a consistent manner. After a short period the Greenwells become massed with tree roots.When the rains and cooler weather come the Greenwells can be removed from their positions out from each side of the trees and used for whatever purpose the home gardeners desire. It is not recommended that Greenwells, for MATURE TREES, are used as explained above in areas that are likely to carry a lot of foot traffic, because of the chance that trip damage could occur.